It was with great sadness that the world heard that one of its heroes had passed away on 25th August. Of course, we all know the story of how Neil Armstrong landed on the moon but so many of us know about how he sent the first ever “moon letter” and started a new collecting craze in the USA. Under great secrecy in case the mission went wrong, the US Postal Service prepared a 10 cent Stamp to celebrate the United States winning the race to the moon. 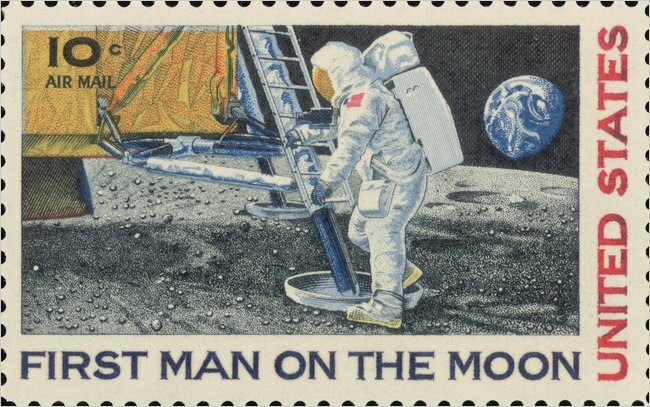 However, what made this stamp unique was the fact that Armstrong and his co-astronaut ”Buzz” Aldrin took with them on their historic journey not just the die that would make the stamp’s printing plates but also a special ‘Moon letter’ bearing a die proof of the stamp itself. The plan was that the letter would be personally postmarked by Armstrong and Aldrin while they were on the Moon. Calle’s main problem however, was envisaging what the moon would actually look like. The artist took a chance and showed the module’s tripod foot making a very faint imprint. Fortunately, that turned out to be exactly right. Although some collectors questioned whether the stamp violated federal law by using a living person’s picture, it was argued that though his features were completely hidden by a space suit, it could have been none other than Neil Armstrong. Aldrin later joined Armstrong on the Moon’s surface. As it turned out, the two astronauts didn’t have time to postmark the “Moon letter.” So the envelope and its die proof actually were given the “MOON LANDING/USA/JUL/20/1969” hand stamp during the return journey. Nevertheless, the Moon letter had travelled more than a half-million miles, a lot lot further than any other piece of post had ever travelled. On their return home, the letter underwent a decontamination period at Houston, along with the astronauts themselves. All were quarantined for 18 days. The die was also processed for decontamination before it was sent to the Bureau of Engraving and Printing, where the process of preparing the plates for stamp production began promptly. Because of its larger size – it was 50 percent larger than conventional U.S. commemoratives – the stamp was produced in sheets of 128 rather than 200 subjects. A total of 152,364,800 stamps were printed and distributed. The stamp inspired great interest among first day cover collectors. Within three weeks after the 9th July initial announcement, there had been 500,000 requests for First Day Covers, which would bear not only the 9th September Washington, D.C., date stamp but also a replica of the July 20 “MOON LANDING USA” date stamp that the astronauts applied to their very own Moon letter. The final tally of first day covers was a phenomenal 8,743,070, a figure that nearly trebled the previous high of three million. In comparison, even the Elvis Presley commemorative stamp of 8th January 1993, one of the most popular stamps in history, received only 4,451,718 official Memphis, Tennessee, first day of issue postmarks. Given the historical significance of this story, it is fitting that stamps and coins will be among the key tributes issued to commemorate the greatest of American Heroes. A great story abouta great achievement. However it just seems a little ironic for this to be about an “Airmail” stamp when there is actually no Air on the Moon. !